As yet unnamed cuboctohedron pop up character. 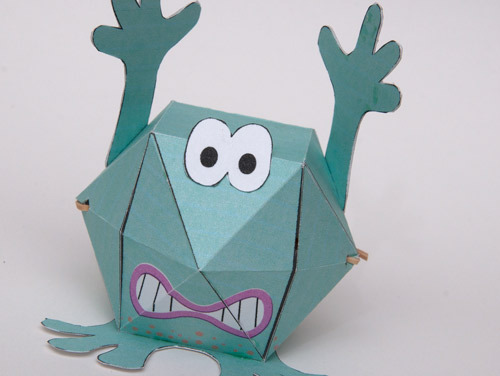 I've completed the parts and photography for a fold flat, pop up cuboctahedron character. I'm really pleased with it, it locks down nicely and pop-up in dramatic fashion! I'll get the rest done in the morning, time to veg out with a good book and a glass of red. Real Cute Rob…why not name it Jumpy, poppy or whoopy. My GOODNESS! that looks a treat! Bravo! Thanks both – The file will come in both coloured and mono. I think it'll be fun to make halloween versions! Rob, what an excellent avalanche of enthusiasm for this little character. I would like to propose the name "pop-upstart"